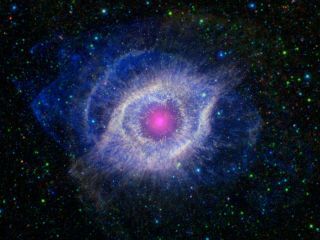 This object, called the Helix nebula, lies 650 light-years away, in the constellation of Aquarius. A pair of NASA space telescopes have captured a spectacular new photo of the Helix Nebula, a glowing celestial vision that resembles a giant cosmic eye. The Helix Nebula (also known as NGC 7293) represents a dying star known as a planetary nebula. The new picture, released Wednesday (Oct. 3), combines data from NASA's Spitzer Space Telescope, which observes in long-wavelength infrared light, and the Galaxy Evolution Explorer (GALEX), which picked out the short-wavelength ultraviolet light coming from the object. The Helix Nebula is located about 650 light-years from Earth in the constellation of Aquarius. It provides a sneak peak at the future of our own sun, which is expected to turn into a planetary nebula in about 5 billion years. Planetary nebulas are stars around the size of the sun that have neared the ends of their lives and run out of hydrogen and helium fuel for fusion in their cores. At this point, they puff out their outer gaseous layers into glowing shells around them, and condense into small white dwarf stars. "The white dwarf is about the size of Earth, but has a mass very close to that of the original star; in fact, a teaspoon of a white dwarf would weigh as much as a few elephants!" NASA scientists wrote in a statement. The white dwarf star is visible in the picture as the tiny white dot in the center of the nebula. This star emits intense ultraviolet radiation, which in turns lights up the outer gas layers in infrared wavelengths. Both ranges of the spectrum are shown here in the combined light of the two telescopes. In the photo, the GALEX data is shown in blue, while the Spitze Space Telescope observations are represented in yellow. Some of the background space is from data collected by NASA's all-sky Wide-field Infrared Survey Explorer (WISE). Planetary nebulas aren't planets at all, but they were erroneously named in the 18th century because they resembled gas giant planets, and the name has stuck.